Social media refers to the means of interactions among people in which they create, share, and exchange information and ideas in virtual communities and networks. With 288 million active users on Twitter, and over 1 billion on Facebook, it’s hardly surprising that both social networks carry such strong power to influence the nation. I’ve picked a few examples of how social media can play a major part in influencing businesses, sway the public and even help the Police. This week I read a story in several of the National newspapers about supermarket chain, Morrisons, changing their dress code regulations after its suspension of a shop worker for wearing a poppy and Help for Heroes badge sparked an angry backlash online. 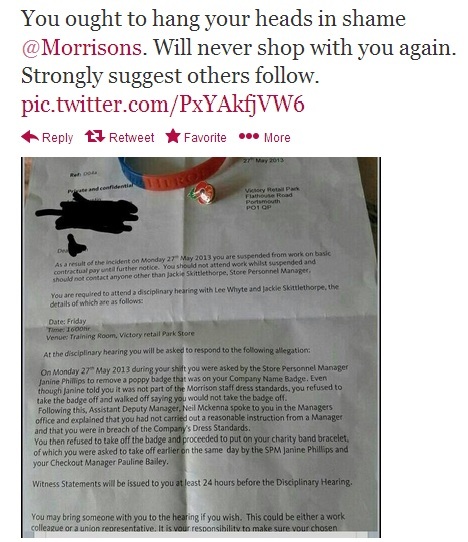 The letter was also posted on the Morrison’s Facebook page and, as a result, boss Dalton Philips received almost 300 angry responses directly. An older example of the power of social media was seen back in 2009 when rock band, Rage Against the Machine, won the most competitive battle in years for the UK Christmas number one. It was seen by many as possibly the greatest chart upset ever as rock fans campaigned on Facebook to get fans to buy as many digital copies of the single ‘Killing in the Name’ as possible. The result was Rage Against the Machine selling half a million downloads, which crushed X Factor winner, Joe McElderry’s ‘The Climb’ by 50,000 copies. This Facebook campaign had 1.2 million supporters. In 2008, confectionary giant, Cadbury, brought back the Wispa chocolate bar after a campaign on Facebook and MySpace demanded its return. After thousands of people joined dedicated groups on both social media sites, Cadbury said that, in the first 18 weeks of the chocolate bar being back on the shelves, they sold 41 million Wispa bars. The London riots in 2011 were sparked by the Police shooting of Mark Duggan. Social media, predominantly Twitter, played a huge role in keeping the public informed of what was going on in their area. Most of the social media traffic began after the first verified reports of incidents in a specific area, with more than 2.5 million tweets being sent. In some areas, namely Tottenham, Police claimed that BlackBerry’s popular, free and encrypted messaging service, BBM, actually helped to fuel the riots and even helped to organise the extensive looting that went on. BlackBerry agreed to assist the Police wherever possible which, in itself, sparked fears from some BlackBerry users that their private messages may be handed over to the authorities. London’s Metropolitan Police also created a page on photo social media site, Flickr, which included CCTV images of rioters suspected of looting and committing violence or other crimes. They also set up a Twitter hashtag #tweetalooter which asked citizens for any information they may have had of known looters or usernames of other Twitter users who could have possibly been stupid enough to admit to stealing goods during the riots. Both of these social media tactics were very successful in making arrests relating to the riots. Following the events, a Twitter account called @riotcleanup was set up, which attracted more than 62,000 followers in just a few hours. Alongside this a Facebook page was also set up in support of the Police, which gained over half a million likes. Despite these incredible examples of just how influential social media can be, some organisations are still unconvinced of the benefits. So, how can social media help a business, regardless of the industry you may be in? It’s an instant, interactive and responsive way to start and maintain conversations and relationships with both existing and potential customers. It isn’t like print media, radio or direct marketing. It allows a two way conversation which companies like to have with their clients. It allows you to listen to, and monitor, what members of the public are saying about you, your competitors, your clients and things that may be relevant to your industry. It can help drive traffic to your company website – most search engines and media monitoring tools now include social media updates and posts within their results. If you’re involved, it means there’s more chance of your organisation being found on the web. It’s not just for bored youngsters who just want to tell the world what they’ve had for dinner or what the weather’s like. The average age of people using Facebook has now risen to 41 years old and the average Twitter user is 37 years old.